Survivor Pass 3: Wild Card is on its way to PUBG PC in Update 27, with a quick pitstop on the Public Test Servers on Wednesday. The Survivor Pass' third iteration will land on live servers March 26 and last through June 4. It includes over 60 rewards PUBG players can obtain over that 10-week period, from backpack skins to coupons for items and keys. PUBG Corp's patch notes for the Wednesday update claims the challenges have been improved in this new iteration. 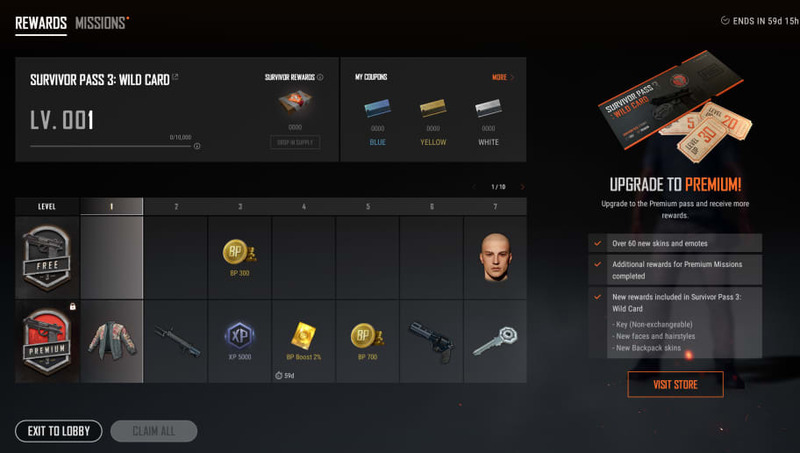 As PUBG Corp adds new background music and real-time mission tracking to the game, its Survivor Pass has honed in on testing players' skills. Current missions will be viewable by pressing 'P.' Daily missions will change each day, and can be swapped out up to three times. Weekly missions will come in waves of 10, and players will be able to swap out up to five per week. Beginner missions will add 10 introductory missions that teach players about the game's mechanics, and challenge missions will test players' abilities with specific, individual weapons such as the Tommy Gun and the UMP45. Each weapon-specific challenge players complete will earn them a weapon skin. Players can purchase the Premium Pass and Level-up Items as in previous passes, with the Premium Pass priced at $9.99 and level-up Items at $4.99 for five levels, $17.99 for 20 levels, and $24.99 for 30 levels.